We have previously developed a long RT-PCR method for selective amplification of full-length PKD1 transcripts (13.6 kb) and a long-range PCR for amplification in the reiterated region (18 kb) covering exons 14 and 34 of the PKD1 gene. These have provided us with an opportunity to study PKD1 mutations especially in its reiterated region which is difficult to examine. In this report, we have further developed the method of multiple restriction fragment-single strand conformation polymorphism (MRF-SSCP) for analysis of PKD1 mutations in the patients with autosomal dominant polycystic kidney disease (ADPKD). Novel and de novo PKD1 mutations are identified and reported. Full-length PKD1 cDNA isolated from the patients with ADPKD was fractionated into nine overlapping segments by nested-PCR. Each segment was digested with sets of combined restriction endonucleases before the SSCP analysis. The fragments with aberrant migration were mapped, isolated, and sequenced. The presence of mutation was confirmed by the long-range genomic DNA amplification in the PKD1 region, sequencing, direct mutation detection, and segregation analysis in the affected family. Five PKD1 mutations identified are two frameshift mutations caused by two di-nucleotide (c. 5225_5226delAG and c.9451_9452delAT) deletions, a nonsense (Q1828X, c.5693C>T) mutation, a splicing defect attributable to 31 nucleotide deletion (g.33184_33214del31), and an in-frame deletion (L3287del, c.10070_10072delCTC). All mutations occurred within the reiterated region of the gene involving exons 15, 26, 15, 19 and 29, respectively. Three mutations (one frameshift, splicing defect, and in-frame deletion) are novel and two (one frameshift and nonsense) known. In addition, two mutations (nonsense and splicing defect) are possibly de novo. The MRF-SSCP method has been developed to analyze PCR products generated by the long RT-PCR and nested-PCR technique for screening PKD1 mutations in the full-length cDNA. Five mutations identified were all in the reiterated region of this gene, three of which were novel. The presence of de novo PKD1 mutations indicates that this gene is prone to mutations. Autosomal dominant polycystic kidney disease (ADPKD; MIM# 173900) is a potentially fatal disease and one of the most common inherited disorders in humans, affecting approximately 1 per 1,000 individuals. The characteristic abnormality is the presence of multiple fluid-filled cysts in both kidneys causing defective functions, ultimately leading to end stage renal disease (ESRD) . Liver cysts and other extra-renal manifestations such as cerebral aneurysm and mitral valve defect, can also be observed . Two known genes are responsible for this disease: PKD1 (MIM# 601313) at 16p13.3 [3–6] and PKD2 (MIM# 173910) at 4q21-23 . The presence of the third locus responsible for this disease is still controversial [8, 9]. A majority of cases (85%) is caused by mutations in PKD1. PKD1 gene spans >50 kb of genomic DNA, containing 46 exons and transcribing ~14-kb mRNA [3–6] that encodes a large membrane-associated glycoprotein, polycystin-1, comprising 4,302 amino acids. The protein possibly participates in the signal-transduction pathway by coordinating with polycystin-2, the product of PKD2, in mediating mechanosensory calcium mobilization by function as flow-sensitive mechanosensors in the primary cilium of renal epithelium . A failure of fluid-flow sensation of the cells may disturb tissue morphogenesis, triggering abnormal cell proliferation and cyst formation. Renal cysts are likely to develop after a second-hit or somatic mutation, which inactivates the inherited normal allele of the same locus, or occasionally an allele of another counterpart locus (i.e.PKD2 or vice versa), giving rise to a trans-heterozygous event . To date, at least 250 unique PKD1 mutations have been identified as listed in the Human Gene Mutation Database (HGMD, http://uwcmml1s.uwcm.ac.uk/uwcm/mg/search/120293.html)  and also reported more recently [13–15]. Three-fourths of mutations in this gene result in truncated protein products, suggesting its inactivation or loss-of-function mechanism. Most previous studies have found unclear genotype-phenotype correlations for PKD1 mutations. However, a recent report has shown the significant correlation between the position of mutation and disease severity (more severe in more 5' mutation), raising the questions whether PKD1 mutations simply inactivate all products of the gene . Mutation databases from worldwide population and additional experiments would be useful to unravel the precise mechanism by which PKD1 mutations cause diverse phenotypes. Analysis of PKD1 mutations is labor-intensive, time-consuming, and expensive because of its large size, the presence of a very high GC content, and most severely the presence of more than six homologous genes, which are highly homologous to the 5' region (exons 1–33) of PKD1 [4, 17]. The latter has made mutation detection in this gene much more difficult. The methods successfully developed for mutation analysis of this gene are based on discrimination of PKD1 from the non-functional homologous genes, by enrichment of PKD1 sequence while suppressing the homologous ones to undetectable levels. PKD1 mutations occur throughout the gene with apparently no mutational "hot-spots", rendering characterization of all disease causing PKD1 mutations in various ethnic groups essential for comprehension of molecular mechanism of the disease and for providing diagnostic genetic testing. Our group aim to fulfill PKD1-mutation database of Thai patients and have previously developed a long RT-PCR technique for isolation of the entire coding sequence of PKD1 (~13 kb) for the analysis of its mutations without interference from the homologous sequences . The analysis of PKD1 transcript provides an opportunity for ex vivo study of splicing defects prior to identification of causative mutations. In addition, a long-range PCR (LR-PCR) for amplification of PKD1-specific genomic sequence with the length of about 18 kb in the reiterated region covering exons 14–33 has also been established for further analysis of PKD1 . Using these techniques, we have previously identified and reported two mutations causing splicing defects of PKD1 transcripts in Thai families with ADPKD [19, 20]. To increase efficiency of screening and identification for other types of mutations in the reiterated region of PKD1, we have further developed a multiple restriction fragment-single strand conformation polymorphism (MRF-SSCP) method , in addition to the long RT-PCR and LR-PCR techniques. Since the SSCP method is more efficient for screening mutation in a short fragment (less than 300 bp), we used different sets of restriction endonucleases for digestions of each PKD1-cDNA segment so that the entire segment was efficiently screened. We have applied this procedure for screening and identifying PKD1 mutations in Thai patients with ADPKD. Here, we report three novel and two recurrent mutations of PKD1 identified in Thai patients; two mutations are possibly de novo. Ten unrelated Thai families with ADPKD attending our clinics at Divisions of Medical Genetics and Nephrology, Department of Medicine, Faculty of Medicine Siriraj Hospital, Bangkok, were included in this study. ADPKD was diagnosed according to established clinical and genetic criteria . Research investigation was conducted in accordance with the Faculty of Medicine Siriraj Hospital Ethics Committee's guidelines and in accordance with the Helsinki Declaration. Blood samples were collected after informed consent for RNA and DNA preparations. Linkage analysis was performed by using 5 polymorphic DNA markers on chromosome 16p including D16S85 (3' HVR), SM7, 16AC2.5, SM6, and KG8 as previously described . RNA prepared from fresh blood sample was used for full-length PKD1 cDNA (~13 kb) amplification by long RT-PCR. The full-length cDNA was then fractionated into nine overlapping fragments by nested-PCR methods as previously described . The sizes of nested-PCR fragments were 1,473–1,678 bp (Table 1 and Figure 1A). The product with abnormal size as shown by agarose gel electrophoresis was further analyzed by restriction endonuclease mapping and sequencing to directly identify abnormal RNA splicing. aThe nucleotide positions are according to HUMPKD1A, GenBank Accession No. L33243. bThe nucleotide positions are according to HUMPKD1GEN, GenBank Accession No. L39891. Bold faces are primers for long-range PCR of which products were used as PKD1-specific templates for nested PCRs. A. Schematic illustration of PKD1 mRNA, long RT-PCR product, and nine overlapping nested-PCR fragments (SI 1–SI 9) used for the MRF-SSCP analysis. B. Maps of the regions in PKD1 amplified by long-range PCR and nested-PCR. The nested-PCR fragments from PKD1 cDNA showing no abnormality in size were further screened for mutation by a multiple restriction fragment-single strand conformation polymorphism (MRF-SSCP) method. This method firstly developed by Lee et al. was modified to use silver staining instead of radioactive detection. A relatively large PCR-product (1–2 kb) for SSCP method could be analyzed since it was fractionated into several short fragments by combined digestions with restriction endonucleases. The restriction enzymes were selected by consideration of their restriction maps on the sequences so that each digestion produced 6–7 fragments with the average size about 200–300 bp and resulted in a discrete size distribution on the SSCP gel. Each nested-PCR fragment was digested with at least two sets of combined restriction endonucleases to generate overlapping-digested products, in order to approximate the position of mutation in the shifted fragment on the SSCP gel (Table 2). The digestion of nested-PCR fragments was performed in a final volume of 25 μl, containing 10 μl of DNA, 2.5 μl of 10× buffer, and 2–5 units of enzymes (e.g. Ava II + Hinf I or Bgl I + Hha I), in the presence or absence of BSA. The reaction mixture was incubated either at 37, 60 or 65°C according to the enzymes used and following the manufacturer's recommendations. Five μl of the digested-PCR product were mixed with 5 μl of 5× TBE and 10 μl of SSCP-loading dye (95% formamide, 0.05% bromophenol blue, 0.05% xylene cyanol, 20 mM EDTA and 10 mM NaOH). The total mixture was heat-denatured at 95°C for 10 min before loading onto the vertical electrophoresis set (size: 17 × 15 × 0.8 cm3) of 10% polyacrylamide gel containing 5% glycerol. The electrophoresis was run at a constant current (20 mA) and room temperature for 4–7 h; the running time was longer for a larger size of the digested fragments. DNA fragments on the gel were stained with silver nitrate . After that, the gel was placed between two sheets of cellophane, left at room temperature to dry, and kept as a record. The fragment with mobility shift was amplified with a newly designed pair of primers. The PCR product was purified and subjected to a direct sequencing using ABI PRISM™ BigDye™ Terminator Cycle Sequencing Ready Reaction Kit and ABI PRISM 310 Automated DNA Sequencer (PE Applied Biosystems, Foster City, CA, USA). A long-range PCR (LR-PCR) was performed to amplify genomic DNA in the PKD1 region covering the nucleotide positions 26340–44438 (18,099 bp). The amplified product was then used as template for nested-PCRs (Figure 1B). The primers used for nested-PCRs are listed in Table 1. The methods for LR-PCR and nested-PCR have been previously described . Briefly, the reaction was performed in a total volume of 25-μl containing 2 μl of the diluted LR-PCR product, 400 nM of each primer, 200 μM dNTP mixture, 10 mM Tris-HCl (pH 8.3), 50 mM KCl, 1.25 unit AmpliTaqGold™ (PE Applied Biosystems) or IMMOLASE™ DNA polymerase (Bioline USA Inc.), 10% DMSO, and an optimal concentration of MgCl2. The nested-PCR product was purified for DNA sequencing to confirm the nucleotide change observed in the PKD1 cDNA. Once the mutation was identified, a simple detection method was developed for direct mutation and segregation analysis in the affected family. In addition, the mutation was examined in 56 DNA samples from unrelated normal individuals (112 chromosomes). The disease-causing mutation should not be observed in these normal DNA samples. Of ten families studied, ADPKD was found to be PKD1-linked or probable PKD1-linked by linkage (haplotype) analysis using 5 polymorphic markers in the PKD1 region on chromosome 16p in eight families. The results of haplotype analysis in two families were inconclusive because of small number of family members. The RNA samples from the probands of these ten families were analyzed by the long RT-PCR and nested-PCR methods. The result showed an about 200 bp shorter nested-PCR fragment (SI 6) of PKD1 cDNA from the proband (II-3) of family PK066, indicating an abnormal PKD1-mRNA splicing. No abnormality in size was, however, observed for all nested-PCR fragments of PKD1 cDNA from the other probands; they were then further analyzed by the MRF-SSCP method. A nonsense mutation and small deletions causing either frameshift or inframe translations were identified in the probands of four families. The details of mutation identified in the five probands and their families are summarized in Table 3 and described below. a Segregation of mutation with disease phenotype b De novo mutation is likely. Reference sequences for DNA and mRNA of PKD1 are GenBank Accession No. L39891 and L33243, respectively. The proband (II-3) of family PK066 was the only one in this family who had the disease with chronic renal failure at the age of 54 years. His father died from coronary heart disease at the age of 70 years and his mother was still healthy at the age of 81 years. It was possible that the haplotype carrying defective PKD1 in the patient might be inherited from his father (data not shown). As it seems that the father did not have the disease, a de novo PKD1 mutation in this family was suspected. The analysis of nested-PCR fragments of PKD1 cDNA from the proband (II-3) of this family showed a possible deletion of about 200 bp in one fragment (SI 6), which was amplified by SI6F/SI6R primers (in the region between the nucleotides 7400 and 8905), in one allele. The location of possible deletion site was examined by restriction endonuclease mapping on the nested-PCR fragment (data not shown) and by amplification with additional pair of primers (SI6.1F/SI6.1B), covering between the nucleotides 7657 and 7978 in the region of exons 18–20, for direct sequencing. The results showed that an entire sequence of exon 19 was missing from the deleted nested-PCR fragment (Figure 2A). Further analysis of genomic DNA of PKD1 revealed a novel 31-bp deletion in the region between the nucleotides 33184–33214 (g.33184_33214del31), involving the last two nucleotides of exon 19 and twenty-nine nucleotides in the first part of intron 19, causing skipping of all sequence of exon 19 (Figure 2A and 2B). Novel PKD1 -splicing defect identified in family PK066. A. Diagram showing splicing defect resulted from a deletion of 31 bp in PKD1 . The deletion of 31 bp (g.33184_33214del31) involves the end of exon 19, splice-donor site and a part of intron 19, resulting in exon 19 skipping in the PKD1-RNA transcripts. B. Direct sequencing analysis of PKD1 -genomic DNA from the proband. The sequencing result shows the 31-nucleotide deletion including the two last nucleotides in exon 19 and the first twenty-nine nucleotides in adjacent intron 19 (g.33184_33214del31) as compared with the sequence of HUMPKD1GEN, GenBank Accession No. L39891. C. Direct detection of the 31-bp deletion (g.33184_33214del31) in the family PK066. The detection of 31-bp deletion (g.33184_33214del31) in members of the family PK066 was directly performed by genomic DNA amplification. Only the proband (II-3) in this family carries the deletion. M represents 100 bp ladder-DNA markers. Direct detection of this 31-bp deletion in genomic DNA samples of the family members could be conducted by LR-PCR of PKD1 and nested PCR using the pair of SI6.1F/SI6.1B primers. The result showed that only the proband carried this novel deletion; none of other six family members including the patient's mother had the mutation; thus, it is likely to be a de novo PKD1 mutation (Figure 2C). In family PK031, the propositus (I-1) was 55 years old who had ADPKD at 43 years. His son and daughter also had multiple renal cysts; however, other 55 members in the family were not affected by this disease, indicating that the propositus had a de novo PKD1 mutation that was inherited to his son and daughter. The MRF-SSCP analysis of nested-PCR fragment amplified with SI4F/SI4B primers (fragment SI 4) from PKD1 cDNA of the proband (I-1) of the family PK031 showed mobility shifts of restriction fragments digested with Bgl I + Hha I and also with Ava II (Figure 3A). These were also confirmed by the SSCP analysis of individual restriction fragments isolated from agarose gels before the analysis (data not shown). The mobility shifts occurred within the restriction fragments with the sizes of 476 and 253 bp when digested with Bgl I + Hha I and with Ava II, respectively (Figure 3A), corresponding to nucleotides between the positions 5670 and 5911 of PKD1 cDNA. The sequence in this region was selectively amplified by a new pair of primers (SI4.1F/SI4.1B) for sequencing analysis. A single nucleotide substitution (c.5693C>T) resulting in a nonsense mutation where a codon for glutamine (CAG) was changed to a stop codon (TAG) at the position 1828 (Q1828X) in exon 15 of PKD1 was observed (Figure 3B). The mutation with the nucleotide substitution was confirmed by sequencing analysis of the PKD1 gene (g.29591C>T). This mutation abolishes a restriction site of Pvu II endonuclease. Nonsense mutation (Q1828X) identified in family PK031. A. MRF-SSCP analysis in SI 4 fragment from the patient of family PK031. The restriction maps of Bgl I + Hha I and Ava II digestions of SI 4 fragment (upper). The dotted square area indicates the region with mobility shifts in the MRF-SSCP analysis of SI 4 fragment from the patient. The SSCP patterns (lower) of SI 4 fragment digested with Bgl I + Hha I (left) and Ava II (right) show mobility shifts of single-stranded DNAs (pointed) in the patient's sample (P) compared with that of normal control (N). Double-stranded DNA fragment-size markers (ds) were included for each set. The mobility shifts were observed in the fragments with the sizes of 476 bp in the first set and 253 bp in the second one. The two fragments were located in the same region within the positions 5670–5911. B. 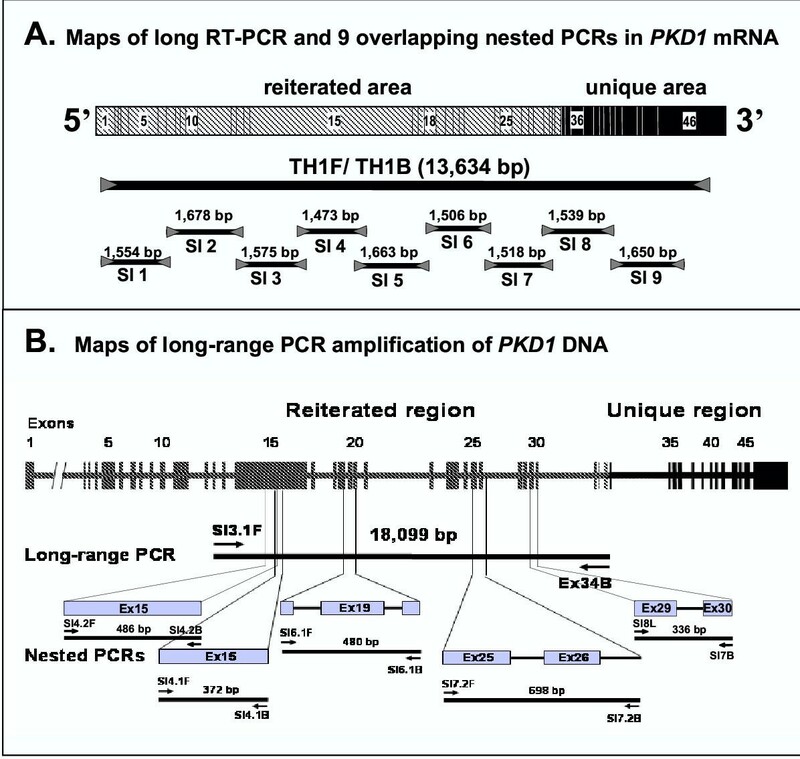 Direct sequencing analysis of PKD1 -cDNA from the patient of family PK031. The sequencing profile shows a nucleotide substitution (c.5693C>T), resulting in a nonsense mutation; CAG (glutamine) was changed to TAG (stop) at codon 1828 (Q1828X).C. Restriction map of RFLP analysis for g.29591C>T (Q1828X) in PKD1 -genomic DNA. Four DNA fragments with the sizes of 117, 134, 91 and 30 bp are obtained from the normal allele, whereas only 3 fragments with the sizes of 251, 91 and 30 bp are generated from the mutant allele carrying the g.29591C>T mutation because of the loss of a Pvu II recognition site at the position 29593. 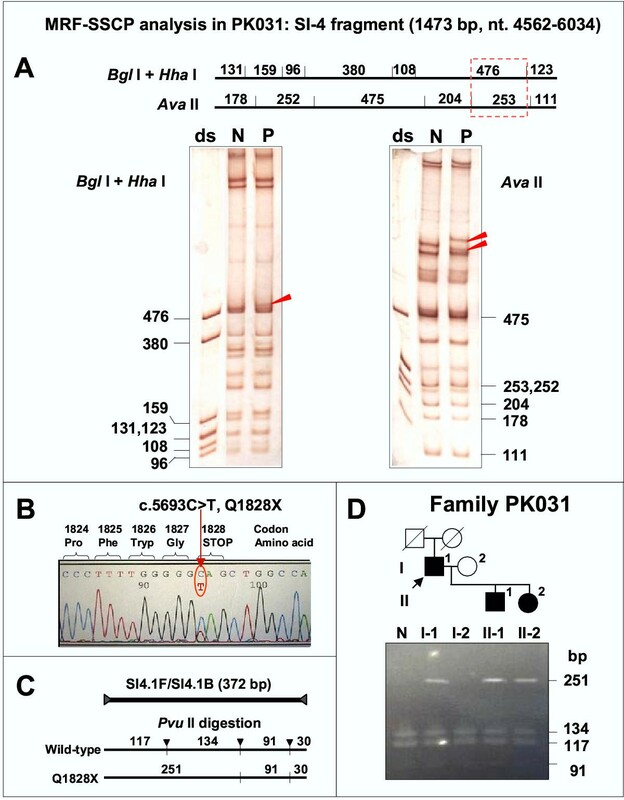 D. Results of direct detection for g.29591C>T (or Q1828X) mutation by Pvu II digestion in members of the family PK031. The appearance of 251-bp fragment in I-1, II-1, and II-2 indicates the presence of Q1828X mutation. The mother (I-2) did not have the 251-bp fragment; thus, she did not carry the mutation. N is normal control sample digested with the same enzyme. Mutation segregation study by Pvu II digestion in the PK031 family demonstrated that three affected members (I-1, II-1, and II-2) carried this mutation while one non-affected member (I-2) did not (Figure 3C and 3D). In family 039, the propositus (I-2) had polycystic kidney disease at the age of 48 years and died of renal failure one year later. The patient's sister (I-1) and her daughter (II-1) were diagnosed as having the disease at 55 and 38 years, respectively. Two (I-1 and I-2) out of three affected persons in this family exhibited renal stone. The patient's sister (I-1) also had severe hypertension causing serious headache but no intracranial aneurysm was detected by magnetic resonance angiography. The MRF-SSCP analysis of nested-PCR fragments amplified with SI4F/SI4B primers (SI 4) from PKD1 cDNA of an affected person (I-1) in this family revealed mobility shifts of restriction fragments digested with either Ava II or Bgl I + Hha I (Figure 4A). A deletion of AG di-nucleotides (c.5225_5226delAG) at codon 1672, resulting in a frameshift translation starting from this codon (Figure 4B) was finally identified. The di-nucleotide deletion was confirmed by sequencing of genomic DNA in exon 15 of PKD1 (g.29124_29125delAG). This mutation has been previously reported in many Caucasian families [15, 24] and its correlation to cerebral aneurysm phenotype was questioned . This mutation abolishes an Eco0109 I restriction site. Mutation segregation analysis by Eco0109 I digestion of amplified genomic DNA samples in the family PK039 showed that three affected members (I-1, I-2, and II-1) carried the mutation while a non-affected person (II-2) did not (Figure 4C). Frameshift deletions found in families PK039 (A-C) and PK069 (D-F). A, D. MRF-SSCP analyses of SI-4 and SI-7 fragments from the patients of families PK039 and PK069, respectively. The maps of restriction fragments obtained from digestions of PCR fragments by sets of endonucleases in two families are shown (upper). The MRF-SSCP analyses (lower) of the patients (P) from both families show mobility shifts of single-stranded DNAs (pointed) when compared with those of normal controls (N). These fragments are located in the dotted box of the upper map. B, E. Sequencing analyses of PKD1 -cDNA from the two patients. The sequencing profiles of both families show different types of two nucleotide deletions (c. 5225_5226delAG and c.9451_9452delAT), resulting in frameshift translation, as compared with the normal sequence. C, F. Direct detection of the two deletions (g.29124_29125delAG and g.39376_39377delAT) in members of the families PK039 and PK069, respectively. The di-nucleotide deletions in PKD1 genomic-DNA in members of both families were detected by restriction analyses. The two mutations abolish recognition sites of Eco0109 I and Afl III, respectively. The presence of larger fragment in each case indicates the existence of mutation. The proband (II-I) of the family PK069 attended our renal clinics with the problem of end-stage chronic kidney disease at the age of 42 years. She was found to have polycystic kidney disease and since then she commenced on hemodialysis. Three of her siblings (II-2, II-3, and II-5) also had the disease but with normal renal function. Her father was still healthy at the age of 81 years. Her mother died of cervical cancer at the age of 38 years. PKD might be inherited from her mother. Mobility shifts were found in the MRF-SSCP analysis of SI 7 fragment from PKD1 cDNA of the proband (II-1) (Figure 4D). The final sequence analysis in both cDNA and PKD1-specific DNA indicated a deletion of AT at codons 3080 and 3081 (c.9451_9452delAT or g.39376_39377delAT), resulting in a frameshift translation starting from codon 3082 (Figure 4E). This mutation abolishes an AfI III restriction site. 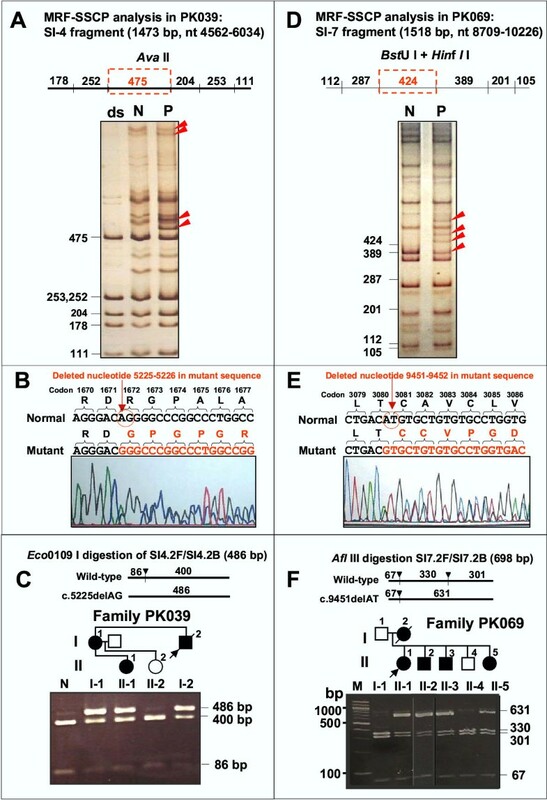 Analysis of the mutation by Afl III digestion in the available members of family PK069 demonstrated that all four affected persons (II-1, II-2, II-3, and II-5) carried the mutation while two unaffected members (I-1 and II-4) did not (Figure 4F). The propositus (II-2) of family PK002 was diagnosed as having ADPKD at 24 years old. He developed ESRD at the age of 50 years old and has been commenced on hemodialysis at frequency of three times a week since then. He is now aged 56 years old. His father (I-1) experienced a long-standing hypertension and died at the age of 52 years. His elder sister (II-1) manifested polycystic kidney disease at the age of 37 years. She is now aged 60, being suffered from chronic renal failure (serum creatinine level 6 mg/dl). Further ultrasound work-up revealed renal cysts in 3 out of 7 members in the subsequent generation. Obvious mobility shifts in the MRF-SSCP analysis were observed in SI-7 PCR product from PKD1 cDNA of an affected member (II-1) of this family when compared with the normal counterparts (Figure 5A). Direct sequencing revealed an in-frame deletion of CTC from c.10070_10072 (or g.41669_41671), resulting in a single amino acid (leucine) deletion at the position 3287 (L3287del) (Figure 5B). Novel in-frame deletion (L3287del) identified in family PK002. A. MRF-SSCP analysis of SI 7 fragment of the patient. The restriction map shows multiple fragment sizes obtained from digestions with two sets of restriction endonucleases (upper). The dotted square indicates the region with mobility shifts in the digested SI 7 fragment from the patient of family PK002. The SSCP patterns generated from digestions with two sets of enzymes (lower) and mobility shifts of single-stranded DNA (pointed) are shown. B. Direct sequencing analysis of PKD1 -cDNA from the patient. The sequencing profile shows a deletion of three nucleotides (CTC; c.10070_10072del), resulting in an in-frame mutation. The CTC deletion causes missing of leucine at position 3287 in polycystin-1 (L3287del). C. Multiple sequence alignment of polycystin-1 from human, dog, rat, mouse, pufferfish and worm by using ClustalW program . Amino acid residues around L3287 are shown. L3287 is highly conserved among distant species in which only in C. elegans that the residue is replaced by isoleucine, which is in the same group of amino acid. D. Direct detection for L3287del in members of the family PK002 by SSCP analysis. The L3287del could be detected by the presence of heteroduplex DNAs on the SSCP analysis. In the family PK002, five members carried the mutation while nine did not. M is standard DNA markers and ds is double-stranded DNA of a normal control. Sequence alignments of polycystin-1 among distant species from human through worm (Caenorhabditis elegans) reveal that L3287 is highly conserved (Figure 5C). In addition, screening in our control set of 112 normal chromosomes did not show the L3287del in PKD1. The L3287del mutation could directly be detected by the heteroduplex analysis of the amplified PKD1-specific fragment. The presence of L3287del mutation in five affected members (II-1, II-2, III-2, III-4, and III-6) but its absence in eight unaffected members of PK002 family were demonstrated (Figure 5D). Using the MRF-SSCP analysis for screening the entire PKD1-cDNA sequence, we found a considerable number of mobility shifts of single-stranded DNA fragments. Many of these mobility shifts were not taken for further analysis because they were common in several patients as well as in normal control individuals. Thus, they were likely to be common single nucleotide polymorphisms (SNPs). In the cases that the mobility shifts were unique in the patients or in families possible to be mutations, they were then subjected to the detailed analysis. However, instead of being disease mutations, several SNPs in the PKD1 gene were identified as presented in Table 4.
aAnalyzed from multiple alignment of PKD1-genomic DNA with 6 homologous genes or pseudogenes [17, 34]. bAllele specific amplification. We have developed a long RT-PCR method for amplification and isolation of the entire PKD1-coding sequence from its RNA transcripts prepared from peripheral blood lymphocytes, avoiding the interference from transcripts of PKD1-homologous genes . This amplified full-length PKD1 cDNA is a useful material for mutation analysis. Since the amplified product was originated from PKD1 mRNA, abnormal transcripts resulted from mutations causing defective RNA splicing can directly be analyzed without the requirement for additional expression experiment. In addition, this amplified product can also be used for analysis of other PKD1 mutations. An LR-PCR for genomic-DNA amplification of 18 kb covering exons 13–34 region of PKD1 has also been developed for confirmatory mutation analysis in genomic DNA . In our previous works, we have demonstrated the use of long RT-PCR and nested-PCR procedure and LR-PCR method for characterization of two PKD1 mutations causing splicing defects in two Thai families [19, 20]. The advantage of simultaneous characterization of abnormal RNA splicing with the mutation has also been demonstrated in a recent work by Burtey et al. who developed a method for PKD1 mutation screening by RT-PCR and reported three splicing defects out of six mutations identified. Unlike our RT-PCR and nested-PCR method that require only 10 PCR reactions per one sample, the recently reported method  needs as many as 57 PCR reactions per one sample. Another advantage of the method that we developed is that it uses reagents and equipments available in general molecular genetic laboratory. In addition, the mutation screening method can be modified to increase efficiency and to be suitable for each laboratory. However, several disadvantages are present in analysis of PKD1 transcript including difficulty in sample handling and storage because of its unstable nature making it unpopular for routine service laboratory, complicated experimental procedure in cDNA synthesis, and presence of false-positive results due to contamination of atypical illegitimate products which sometimes puzzle interpretation of result and make it necessary to analyze of PKD1-genomic DNA for confirmation of mutation. In this study, we have further applied the developed long RT-PCR followed by nested PCR and long-range genomic-DNA amplification for analysis of mutation in the reiterated region of PKD1 in Thai families with ADPKD. The MRF-SSCP technique has been developed and preliminarily used for screening other types of mutations. This method is able to screen mutation in a long cDNA fragment (>1 kb) amplified by nested PCR and it is feasible to use for mutation screening in the entire sequence of PKD1 cDNA, reducing the numbers of PCR reactions and SSCP gels required for the analysis. In the application of long RT-PCR and mutation screening by MRF-SSCP in our study, we could detect PKD1 mutations in 5 out of 10 families (50%). The limitation of detection rate may be due to low sensitivity of SSCP for mutation screening in long cDNA fragments (>300 bp) usually present after the digestion of PCR products with restriction enzymes and also probably due to the use of only single SSCP condition. However, this detection rate is comparable to that of protein-truncation test (PTT) which is about 52% [26, 27] although it is lower than that of DGGE [28–30] and DHPLC  which are about 60% and 70%, respectively. In the MRF-SSCP analysis, false-positive mobility shifts of the digested-cDNA fragments were found to be about 10%, which could be mainly eliminated by repeating the screening experiment or performing the analysis in more than one affected members in the same family. Although PTT method can screen for a relatively large cDNA fragments (~2 kb) and the detected alterations are almost all pathogenic mutations, its major disadvantage is that missense mutations, which are a significant source of PKD1 mutation  or small in-frame changes are not detected. Thus, it may not be an ideal screening method for detection of all types of PKD1 mutations. DGGE and DHPLC are the methods of choice provided that the equipments are available and the detection conditions are well optimized. Direct sequencing of the entire PKD1 gene is however very expensive if mutation screening is not initially performed and it may not be appropriate for such a large gene as PKD1. Using the previously reported and this newly developed method, we have identified three novel (splicing, frameshift and in-frame) mutations and two known (nonsense and frameshift) alterations in five Thai families with ADPKD (Table 3 and Figure 6). Two of these (splicing and nonsense) changes are possibly de novo mutations. All these mutations located in the reiterated region which were confirmed by analyses of PKD1-genomic DNA using LR-PCR method and direct sequencing. 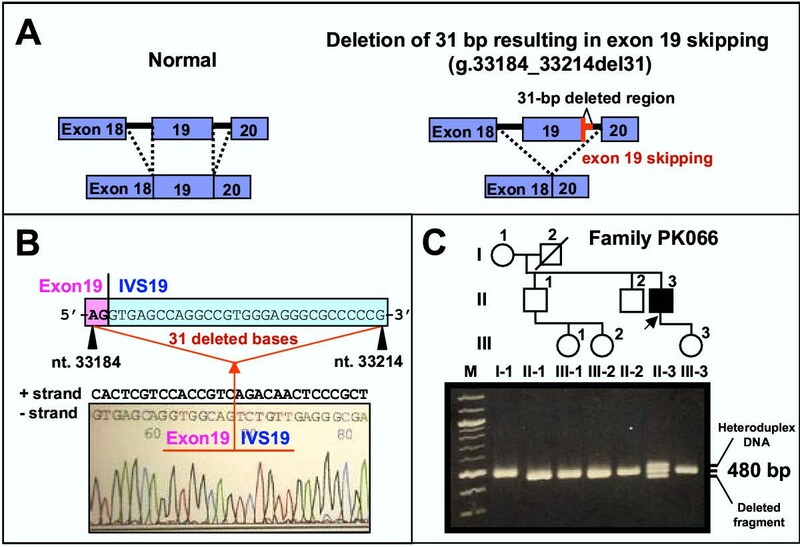 A novel splicing defect that was identified in family PK066 is g.33184_33214del31 which resulted in exon 19 skipping, most likely because of the deletion of splice-donor site of intron 19. Missing of exon 19 sequence in PKD1 mRNA will cause a frameshift in polycystin-1 translation. The predicted protein would have a novel 50 amino-acid sequence after the residue 2497 and would terminate at the position 2548. Thus, the mutant protein would lack almost half of polycystin-1 in its C-terminus starting from the REJ module. The second novel mutation is a frameshift deletion (c.9451_9452delAT) identified in family PK069, resulting in a frameshift translation after codon 3081. Novel 95 amino acids would be observed in this mutant protein before premature termination at the position 3177, truncating all the C-terminus of polycystin-1 beginning from TM 1. The third novel mutation identified in family PK002 is an in-frame deletion (L3287del) affecting a highly conserved residue in TM2 domain of polycystin-1. The proband in the family had ESRD and the youngest affected member (III-6) was diagnosed at 7 years old (Figure 5). The frameshift mutation due to di-nucleotide deletion in exon 15 (c.5225_5226delAG) found in family PK039 has been previously reported in several unrelated Caucasian families [15, 24]. The di-nucleotide deletion causes frameshift translation beginning at codon 1672, introducing novel 97 amino acids and premature termination at codon 1768. This mutation might associate with cerebral aneurysm  but this association was not seen in this reported Thai family. Instead, it is suspected to correlate to ESRD as observed in the proband. A nonsense (Q1828X) mutation in exon 15 identified in family PK031 has recently been reported in a European family (P 293) in which another nonsense mutation (S2164X) was concurrently identified on the same chromosome . This nonsense (Q1828X) mutation in the Thai family should occur independently as a de novo event in the patient and inherited to his son and daughter, since this mutation and ADPKD were not observed in other 55 members of his kindred. Distribution of PKD1 mutations identified in Thai patients with ADPKD. Diagrams of polycystin-1 (upper) and PKD1 gene (lower) show domain structures and coding regions for the protein domains, respectively. 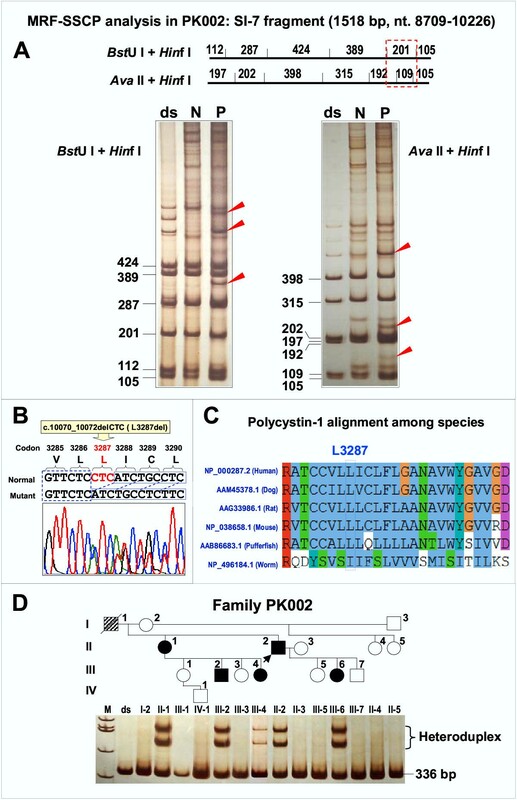 Seven PKD1 mutations (above polycystin-1) were identified by our groups, while the other eighteen (under polycystin-1) were also reported in Thai patients by Phakdeekitcharoen et al. [31, 32]. Majority of the mutations locate in the regions encoding PKD repeats, REJ and the beginning TM domains. PKD1 mutations reported so far in Thai families appear to be heterogeneous, similar to other ethnic origins worldwide. 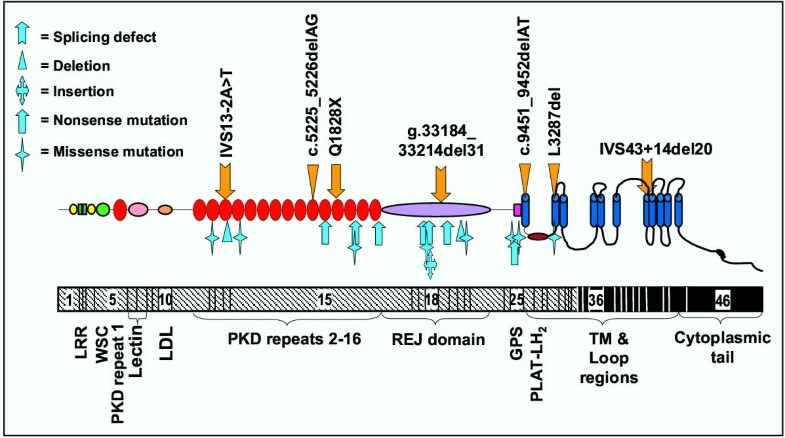 However, some degree of clustering of mutations in the regions encoding the PKD repeats and REJ domain of polycystin-1 is noticed (Figure 6) [19, 20, 31, 32]. The mutations that we identified in this and previous studies [19, 20] consisted of splicing, frameshift, in-frame and nonsense alterations. We have not yet observed missense mutations which have already been reported in Thai patients with ADPKD by Phakdeekitcharoen et al. [31, 32]. It is possible that our method has a low sensitivity for detecting missense mutation. However, as several single nucleotide polymorphisms (SNPs) could be identified (Table 4), we believe that our method is capable to also identify this type of mutation. It is likely that no detectable missense mutation in our study may occur by chance. No relationship between specific mutation and clinical manifestations was found from our data, similar to that observed in many other reports. With our long RT-PCR and nested PCR and the mutation screening by MRF-SSCP method or other modifications to increase screening efficiency such as the use of DHPLC , we expect to identify majority of PKD1 mutations, if not all, in our patients for the benefits of better understanding of pathogenesis of ADPKD, development of rapid molecular genetic diagnosis, and improvement of preventive measure for the complications related to the disease. This study is the first report using the long RT-PCR method in combination with MRF-SSCP for mutation screening of PKD1 cDNA and total five mutations were identified within the reiterated region. Three mutations (splicing defect, frameshift alteration and in-frame deletion) are novel. Two mutations (splicing defect and nonsense change) are possibly de novo. PKD1 mutations reported so far in Thai patients with ADPKD are heterogeneous but mutations in a majority group of patients are still unknown, requiring further characterization. We thank all ADPKD patients, family members, and laboratory personnel who participated and donated blood samples for the study. We also thank staff members of the Renal Unit, Department of Medicine, Faculty of Medicine Siriraj Hospital, for helping in the blood sample collection. This work was supported by the Thailand Research Fund (TRF) Post-Doctoral Research Grant (to WT), Mahidol University and National Research Council of Thailand (NRCT) (to CL), and the National Center for Genetic Engineering and Biotechnology (BIOTEC), Thailand (to PY). WT set up and carried out the molecular genetic studies, co-ordinated experimental work, and drafted the manuscript. CL as a clinical geneticist was responsible for clinical examinations, providing genetic counselling and consultation to the ADPKD patients and families, collecting clinical and family data. KV as a nephrologist was responsible for clinical and nephrological investigations, collections of clinical data and blood samples. CS as the first clinical geneticist initiated the medical care and clinical genetic studies, diagnosed and recruited the ADPKD families. DB took part in PKD1 mutation analysis. NR performed the linkage analysis. PY co-ordinated research activity, designed experimental studies, participated in discussion and interpretation of results, and corrected the manuscript. All authors have already read and approved the final version of the manuscript.